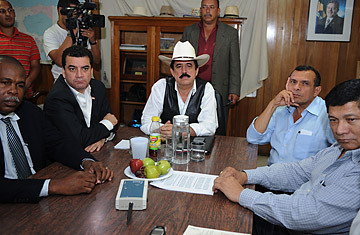 Ousted Honduran President Manuel Zelaya (C) receives Honduran presidential candidates for the Christian Democracy Party, Felicito Avila (R), for the ruling Liberal Party, Elvin Ernesto Santos (2-L), for the Innovation And Unity Party (PINU), Bernard Martinez (L) and for the National Party, Porfirio Lobo Sosa (2-R), at the Brazilian embassy in Tegucigalpa, September 24, 2009. Honduran President Manuel Zelaya believes he put his adversaries' backs to the wall this week. He may, however, have painted himself into a corner as well. By sneaking back into Honduras on Sept. 21 and taking refuge inside the Brazilian embassy in Tegucigalpa, the exiled leader  deposed in a June 28 military coup  hoped to turn up pressure on the de facto government to negotiate a settlement that would put him back in office until his term ends in January. But in a telephone interview with TIME on Friday, Zelaya complained of noxious tear gas wafting into the embassy, the scene this week of deadly clashes between his supporters and Honduran security forces. And he seemed to acknowledge that he's also turned up pressure on himself to get Hondurans and the international community fervently enough behind him to end the standoff. "We want this to end soon," he says. "But I may have to summon all my spiritual strength to get through it." Those who back Zelaya's restoration, including the Obama Administration and every other world government, argue that condoning a military coup would simply set Latin America's democratic clock back to the dictator-infested 20th century. Zelaya's opponents equate his leftist politics with those of Venezuelan President Hugo Chavez  whom they call a socialist caudillo  and they point to Chavez's declaration this week that he helped Zelaya get to Tegucigalpa as proof that Zelaya is the Venezuelan's puppet. Zelaya says he got no help from Chavez and, contrary to Chavez's statements this week that he advised Zelaya to take refuge with the Brazilians, tells TIME the Venezuelan President did not know he was headed to that embassy. "No one knew," says Zelaya. "I'm a great friend of [Brazilian President Luis Inacio Lula da Silva], who has given me a lot of support, so going there was a sensible thing to do." Either way, Zelaya, 57, says he trekked 15 hours by foot, car and plane (he won't say over which border or who helped him) before showing up at the Brazilian mission. It took him in, even though it may have to host Zelaya, who would be arrested if he stepped outside, for weeks if not months. Zelaya had tried unsuccessfully to fly and walk into Honduras in July. "How could I stay in exile," he asks, "when the coup has been condemned by every country in the world? I had to come back to show support for the people who elected me." Even those who support restoring him to office wonder if his theatrical return actually hurts his chances of getting de facto Honduran President Roberto Micheletti to agree to a settlement. But Zelaya insists it has turned momentum his way: "The coup leaders are like anyone who committed a crime and wants to hide it. You have to keep the spotlight on it." After Zelaya told the Miami Herald earlier this week that the Micheletti government was "threatening me with death" and that "Israeli mercenaries" were trying to zap him with high-frequency radiation, Brazil admonished him to soften his rhetoric. But after army and police riot squads were criticized at home and abroad this week for their heavy-handed use of clubs, tear gas and mass arrests, Zelaya still argues, "We came here for dialogue and they answer us with war. Since the coup this has become a violently repressive regime." Micheletti supporters, however, suggest that's part of Zelaya's strategy. The only way he can win, they say, is if his demonstrators can prevent the country's Nov. 29 presidential election from taking place, or provoke security forces into atrocities that would force the U.S. or the U.N. to intervene more forcefully. Zelaya also hints that he came to Tegucigalpa in part because he and his leftist allies in the region, including Chavez, felt the U.S. has been too tepid in trying to leverage Micheletti. (The Obama Administration has cut off some $30 million in aid to Honduras as well as visas, and has threatened not to recognize the presidential election results if Zelaya is not returned to office by then.) "President Obama and Secretary of State [Hillary] Clinton have made a great effort, and I realize they live in a democracy with limits on their actions," he says. "But I do feel they could and should do more, like trade sanctions." When reminded that the U.S. is largely prevented from cutting off trade with Honduras because of the Central American Free Trade Agreement (CAFTA), Zelaya insists, with some irony, "I am still the legitimate President of Honduras, and I approve of that action." The Micheletti camp, which denies Zelaya's ouster was a coup, says Zelaya was booted out because he defied a Supreme Court order not to hold a non-binding referendum on whether to convene a special assembly to reform Honduras' Constitution. The move, say Zelaya foes, was a veiled attempt to eliminate presidential term limits and usher in Chavez-style socialism. But Zelaya, while arguing the Constitution needs to be modernized to better help the 70% of the population who live in poverty, says the referendum "was an opinion poll, and it never once mentioned extending presidential term limits." Despite evidence to the contrary, Zelaya denies that he defied the Supreme Court. (The matter was being appealed, he says.) But, like the rest of the hemisphere, he asks, "Even if I did, why wasn't I charged and tried in court instead of removed before dawn by the threat of soldiers' bullets and flown away? The army chiefs say it was because I was a communist, that Chavez and Fidel Castro were coming to take over the country. But in fact I was pursuing social policies, like raising the minimum wage, that our economic elite found threatening." When elected in 2005 with his trademark cowboy hat, Zelaya was widely considered a centrist  and even now he denies that he took the hard left turn as President that his critics accuse him of, despite his strong alliance with the more radical, anti-U.S. Chavez. "It's like when people in your country call President Obama a socialist just because he stumps for healthcare reform," Zelaya says. "The presidential term limits issue was just a false pretext for a coup." Zelaya is now betting he can bring the coup leaders to the table to sign the San José Accord, the deal brokered by Costa Rican President Oscar Arias with the backing of the U.S. and the Organization of American States. It would return Zelaya to the presidency for the waning months of his term  but with certain conditions, such as dropping the Constitutional reform effort  while granting an amnesty to the coup leaders. "We have to do this," says Zelaya. "I don't want to see Honduras become the first Latin American country of the 21st century to revert to a coup to remove a President." Conditions had improved in the embassy for Zelaya and his entourage since the de facto government restored the building's electricity and water (which Micheletti was widely criticized for having turned off after Zelaya arrived.) Zelaya ended the interview, however, when he claimed the air inside the embassy had gotten too thick with tear gas and possibly other irritatnts. It was a reminder of how murky, and painful, the weeks ahead in Honduras promise to be.